So I’ve been seeing russian piping tips all over the internet and I finally broke down and bought a set – seriously the LARGEST set I could find – now I probably wont use most of these ever again – but I like having everything so I can try them out and make informed choices! For this tutorial I only used about half the tips in the set – the ones that obviously were for flower making – still have to play with the other half and see what they can do! But that’s another post for another day! 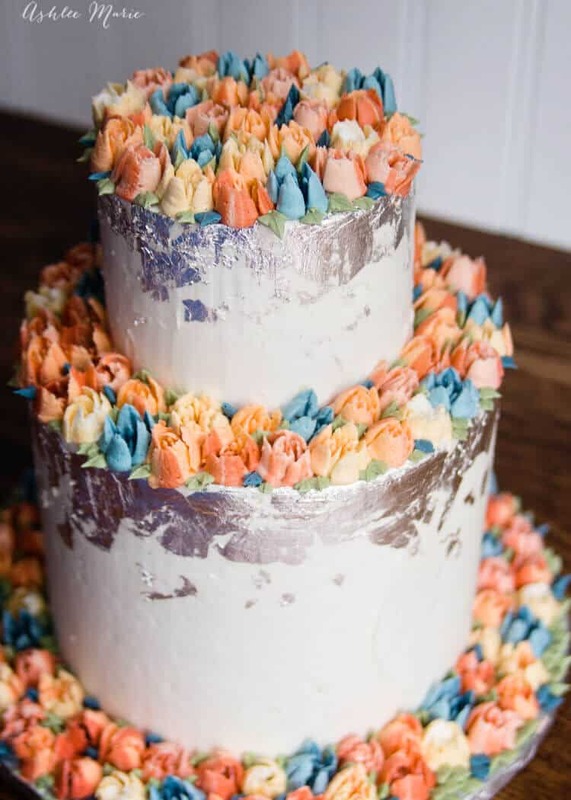 ANYWAY when some friends of mine were having a small wedding recently I wanted to make something special for them and they gave me free reign… All they wanted was buttercream, so I used the flower colors from her daughters dresses to color the buttercream and decided to give my new Russian tips a try! It turned out PERFECT! Understated but still a statement! 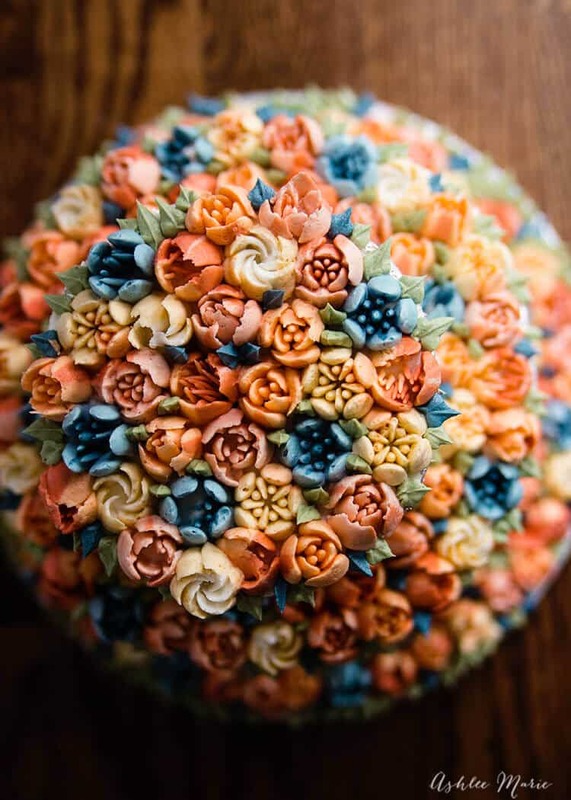 All buttercream, and how lovely are the colors! So the colors – as you can see in the video I made a half a dozen colors, the green was just for leaves. The rest of the colors I intermixed to give each piping tip it’s own variation. Now you can simply fill your piping bags, layering different colors as you fill it, or trying to keep one color to one side… but I wanted a more uniform look. so I spread out the frosting onto 6 different sheets of plastic wrap, varying the stripes and colors. Then I rolled it up – candy style – I refrigerated it until ready to use. Then I just cut off one end and slid it into the piping bag with the tip! worked great! So the key to the russian piping tips? 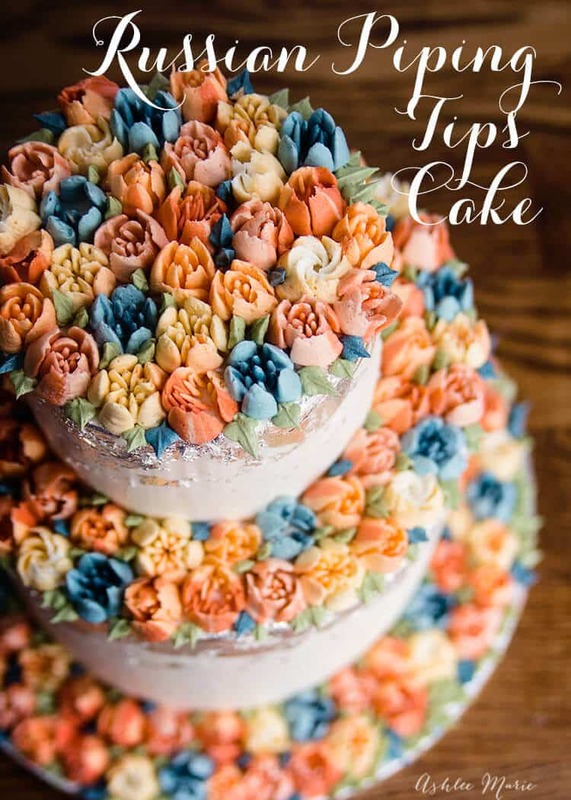 1st your buttercream texture – not too stiff – or you’ll have broken edges, not so soft that it’s droppy or the details get lost. 2nd your pressure – press too hard and you lose the details – don’t press hard enough and the flowers won’t stick… So I’d say it DEF takes practice to find what works for you. The balance in the texture and the pressure is what it will come down to. and of course each tip is also a little different, some needed the pressure to be changed a little for it to work best. Finally I’d recommend NOT making your cake under lights that raise your kitchen temperature by like 50 degrees… my frosting kept getting to warm under my work lights so I kept having to put the frosting in the refrigerator. So what about you? have you tried them? will you? 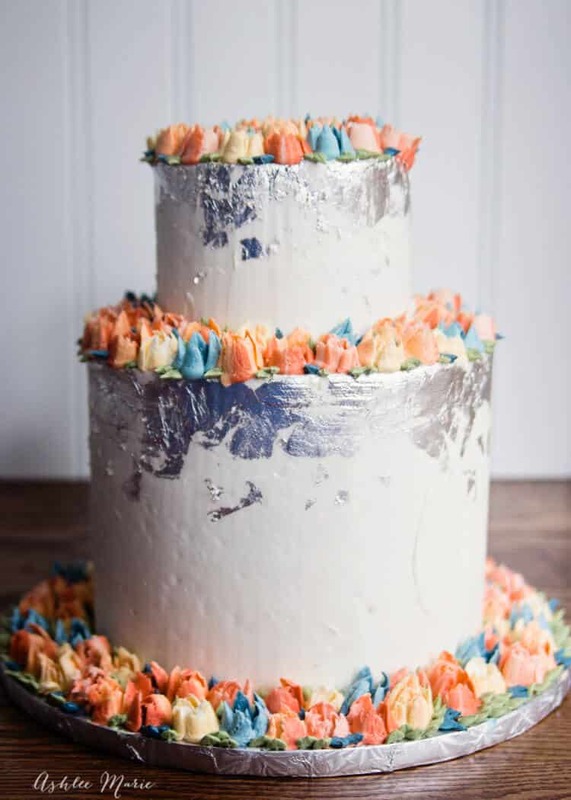 have a suggestion for a cake that would look amazing with them? Let’s hear it! Rediscovering love of cupcake decorating now that I an retired. 80% flower failure with Russian tips though. Could not get them to stick to surface when trying to make the design. Could this be the icing was to dry? The other 20% upside was, it taste delicious and ate some of my failures!! I could actual recognize a few roses, but very few, so added more confectioners sugar. LOL. Maybe to dry and hard to push through bag. Can’t wait to try again, Do you have a buttercream recipe you recommend?